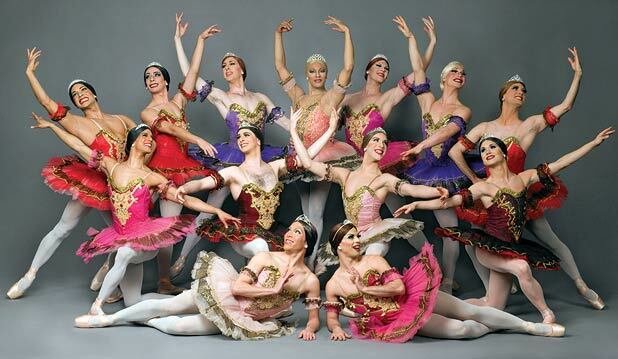 Review: Les Ballets Trockadero de Monte Carlo. Nottingham Royal Concert Hall. – East Midlands Theatre. 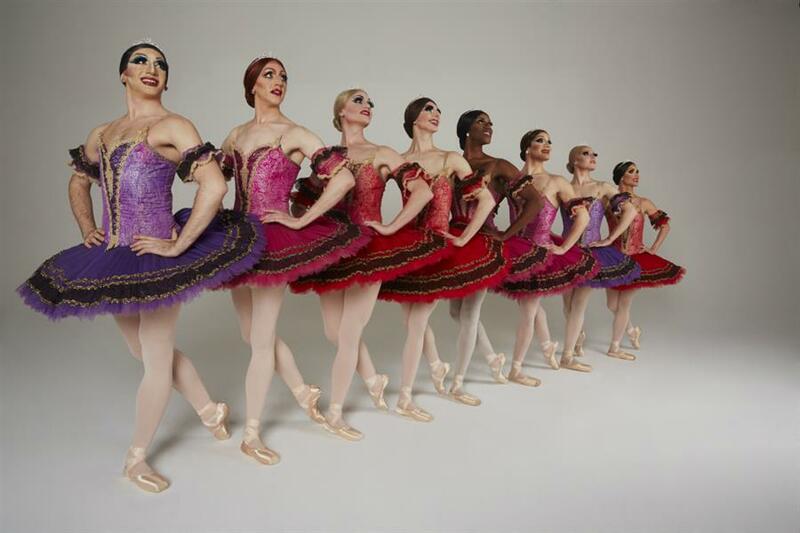 It’s not often you can say “This is the funniest evening at the ballet.” With the wickedly funny Les Ballets Trockadero de Monte Carlo (The Trocks) on stage at Nottingham’s Royal Concert Hall 23rd-24th October 2018 you can. The all male troupe of highly skilled ballet dancers have ridiculous fun parodying classical and some modern ballet with their humorously observed repertoire and obvious respect for the genres. The Trocks dance in classical feminine style en pointe and in tutus and ham up the ballet with great affection. The dancers adopt cod-Russian stage names such as Vladimir Legupski, Ida Nevasyneva, Olga Suppozhova and Nadia Doumiafavya. The result is a pleasing blend of parody and tribute, grand art, music hall and drag act (with no ‘tucks’) that is frequently played straight. Swans appear twice in this show, firstly in the opening number Le Lac Des Cygnes, and later with the dying swan scene with Robert Carter as the dying swan. With seemingly endless amounts of white feathers falling from his tutu his eloquent arms and feathery footwork speak for the artistry and he milks his over the top dying to gales of laughter. The music for the dying swan is by Camille Saint-Saëns from Le cygne from Le Carnaval des animeaux. Tchaikovsky’s music is readily familiar in part one as are the evil wizard swanning about in a mad fury. Benno (Roberto Vega) and Prince Siegfried (Duane Gosa) are out hunting and the girl swans glide majestically about with Odette. Except in the Trocks version the evil wizard Von Rothbart (Robert Carter) can’t find his follow spot, swans collide and then regroup in perfect timing picking up the recognisable poses. Benno and the Prince argue and the whole thing is a gloriously funny pastiche. Even a Merce Cunningham inspired piece, Patterns in Space, gets the Trocks treatment. His abstract style is perfectly parodied with the dancers’ po faced seriousness and attitudes. The two accompanying John Cage avant garde style musicians Olga Supphozova (Robert Carter) and Innokenti Smoktumchsky (Carlos Hopuy) are hilarious. Noah Herron, Jahmal Chase and Hoajun Xie are the Patterns in Space dancers. With music by Cesare Pugni, Pas De Six From Esmeralda, is from a three act ballet based on Victor Hugo’s Notre Dame De Paris. Again we have very accomplished dance with a touch of mocking gypsy girls humour and a daft banana scoffing ballet dancer. The costumes are sensational in this, as they are throughout. The finale comes in the shape of Paquita with stirring music by Ludwig Minkus and choreography after Marius Petipa. The lead ballerina is danced with consummate style and superb control by the very talented Long Zou with occasional support from Cavalier (Giovanni Ravelo). The male corps de ballet are excellent as the girl ballet dancers and this piece is the bravura highlight of the evening.